Gary Pendleton’s illegal campaign signs around Raleigh are the least of his problems. 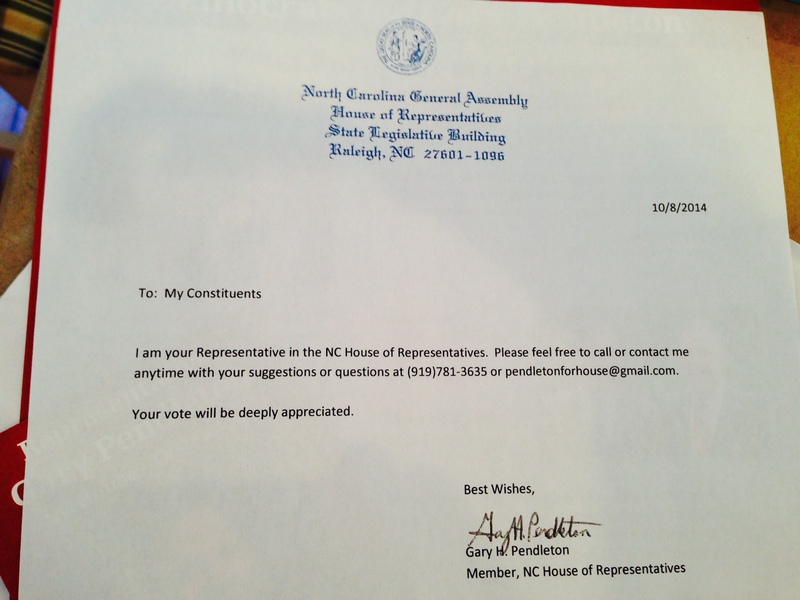 Pendleton, running for NC State House District 49 against Kim Hanchette has used a facsimile of legislative letterhead to solicit votes in apparent violation of Legislative Ethics Guidelines. Pendleton is a relatively new incumbent, having been appointed 8/18/2014 to the seat made vacant by the death of Jim Fulghum. Official legislative stationery or mailing privileges may not be used to solicit votes and, according to a recipient of such a letter, it did not contain a required clear disclaimer stating that the stationery was not printed or mailed at State expense.